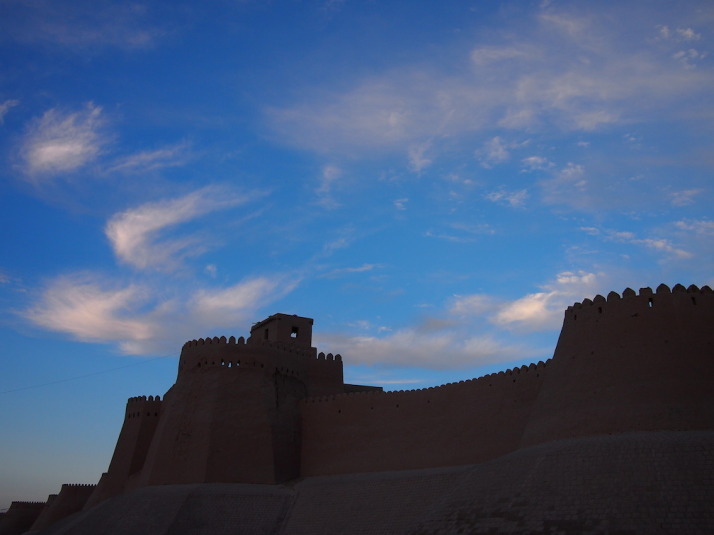 Located on a lesser travelled side street of the Great Silk Road, Khiva has retained its central, compact earthen Ichon-Qala, or inner walled city. 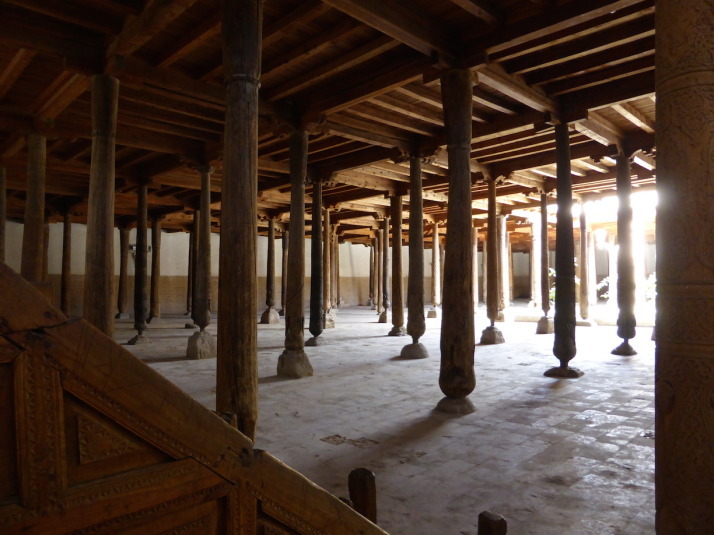 We stayed inside the mud-walled city itself, and the effect of the tan-coloured narrow alleys only served to highlight the stunning turquoise tile work of the medressas and minarets. We had planned two full days here because entry to almost all of the sights are included on one ticket – just 35,000 som each (about £7). 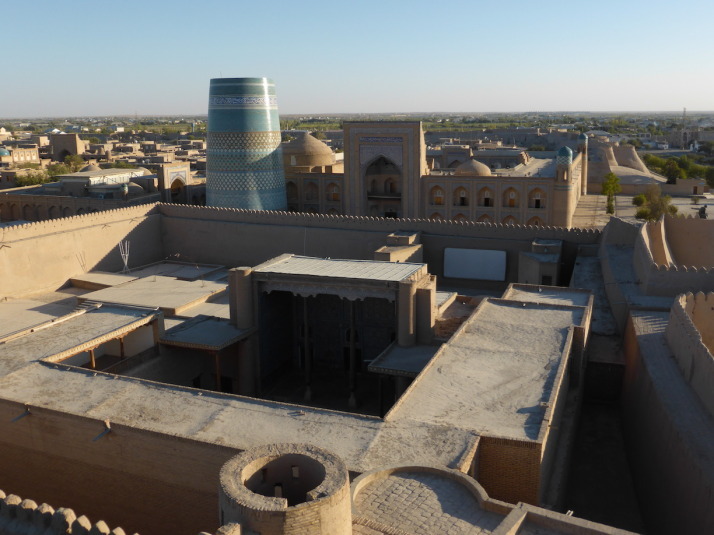 I’m sure you’ll breathe a sign of relief when I say I’m only going to mention our highlights of Khiva, as we managed to see nearly everything on the ticket! 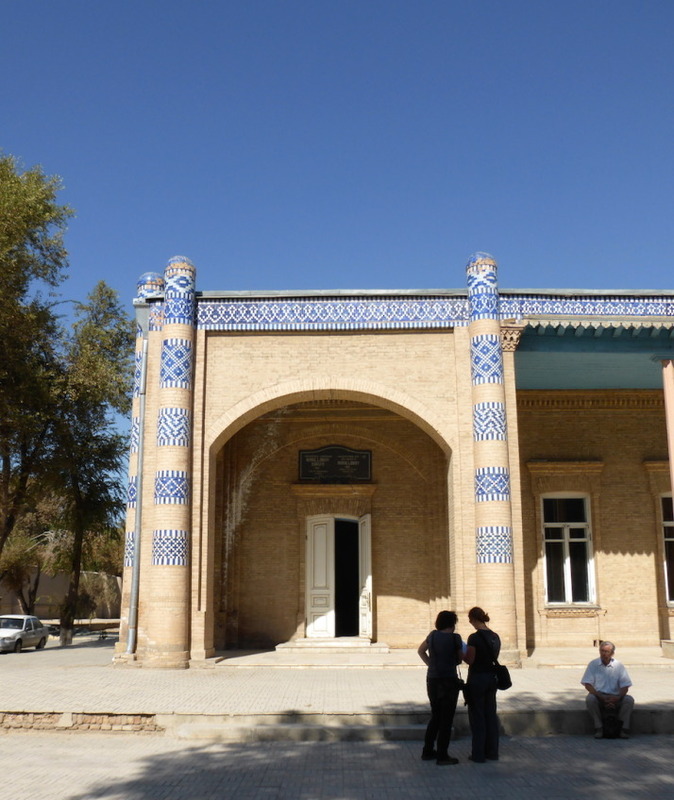 First up was the Pahlavon Mahmud Mausoleum which isn’t much to look at from the street, but inside it reveals a tranquil courtyard with the main mausoleum straight in front and a room of tombs to the left. 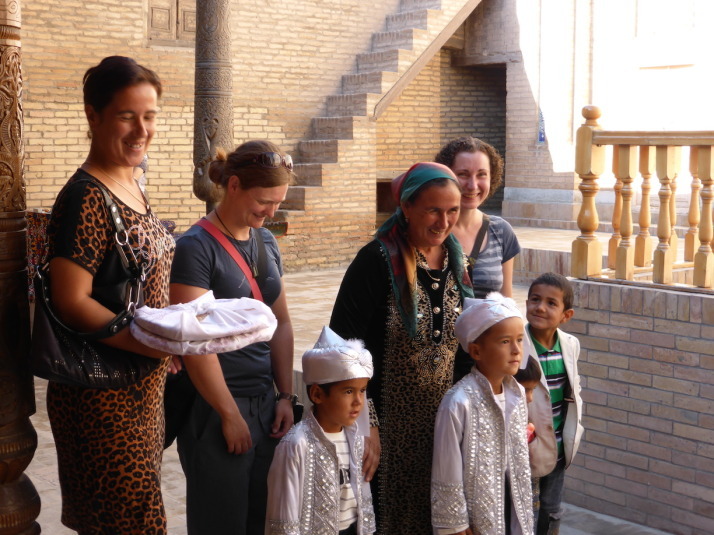 As we paused to take photographs, a family of worshippers followed us in with very smartly dressed children. The parents grabbed Julie and Jo for a spontaneous photo shoot..
Pahlavon Mahmud was a poet, philosopher and a wrestler (! 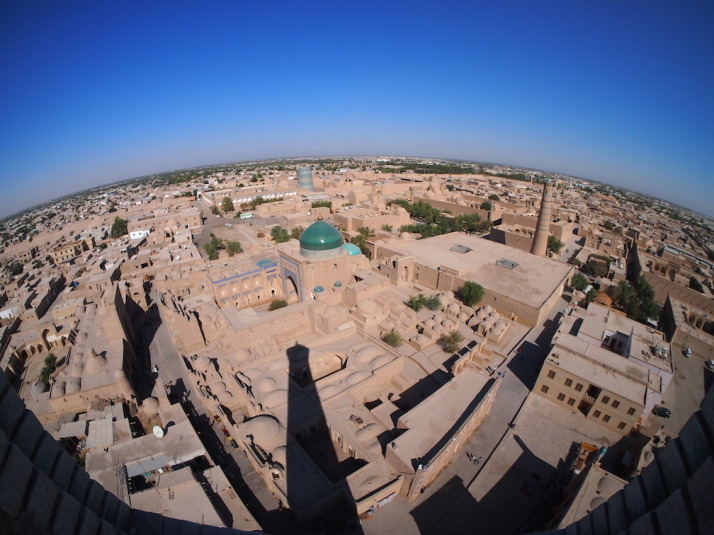 ), who later became the patron saint of Khiva. 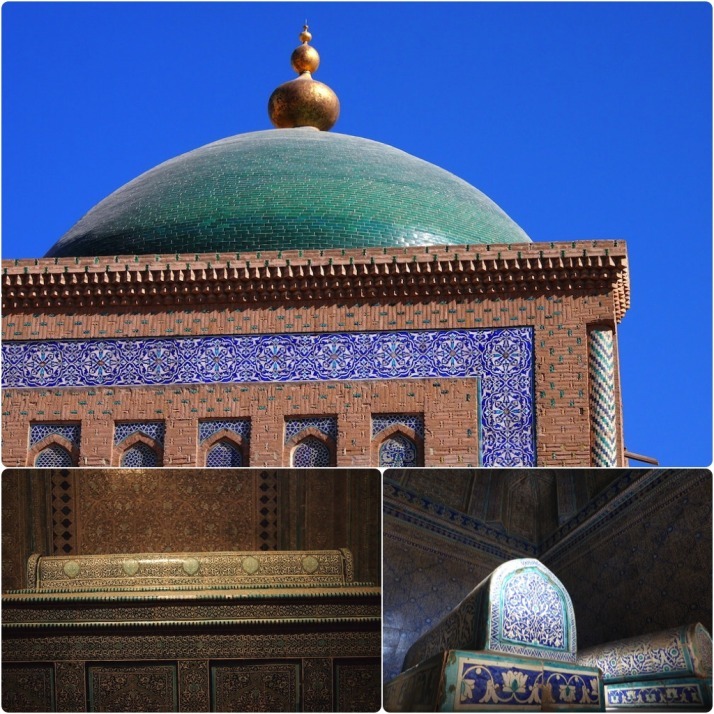 The tiling inside the main chamber and of Mahmud’s tomb is exquisite. 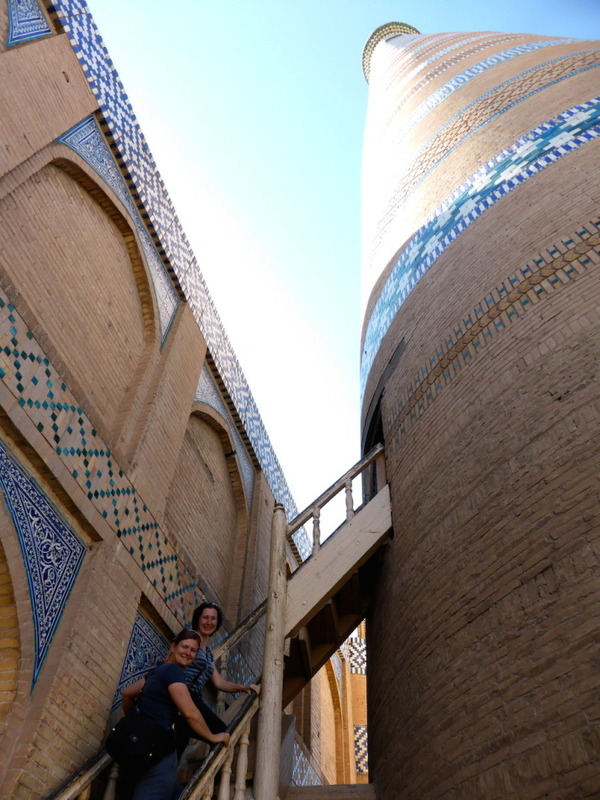 After a few more sights we took a break to climb the Islom-Hoja Minaret, the tallest one in Uzbekistan! The stairs inside were narrow and ascended anti-clockwise. The steps were steep which meant it was hard going but only took a little time to reach the viewing platform at the top. 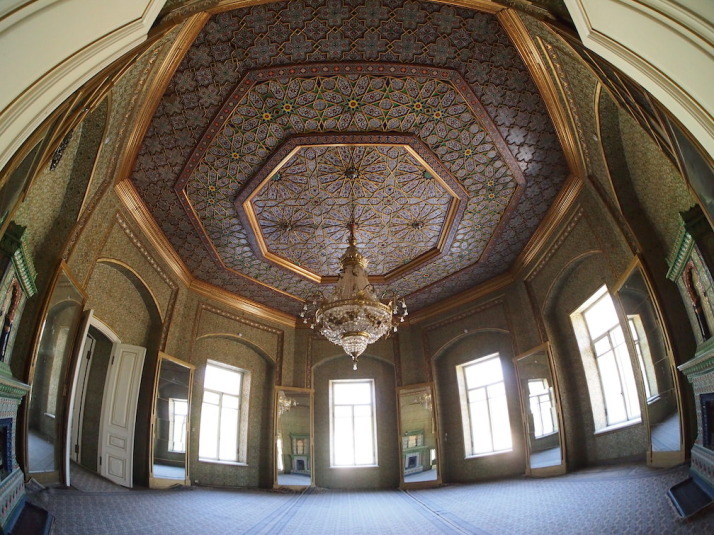 Having climbed his minaret, we then visited Islom Hoja’s Medressa which is also the Museum of Applied Arts. 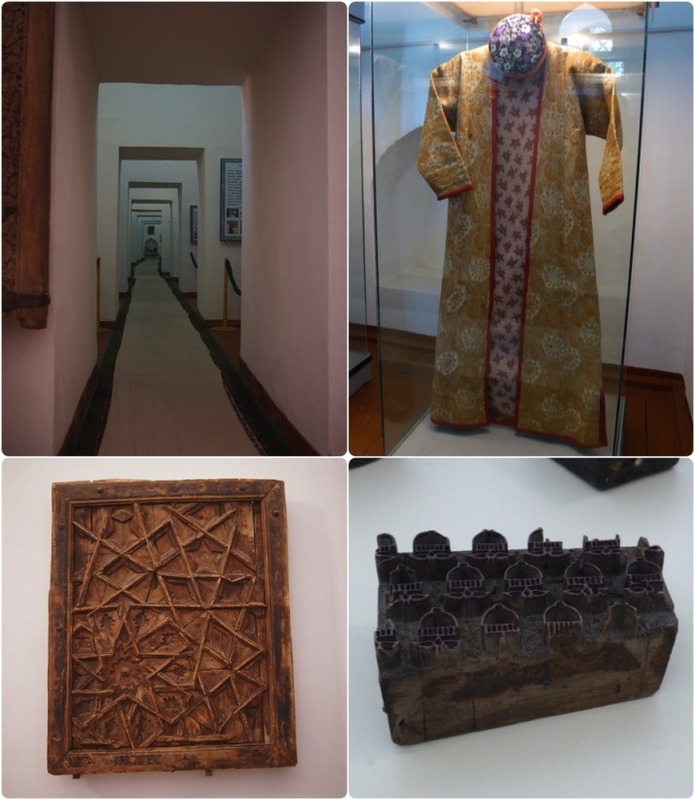 It seems that they’ve knocked through all of the student and teacher cells on the ground floor to create a long corridor of tiny rooms in which we found a very eclectic exhibition – woodcarvings, metalwork, carpets, clothing, books and stone carvings. 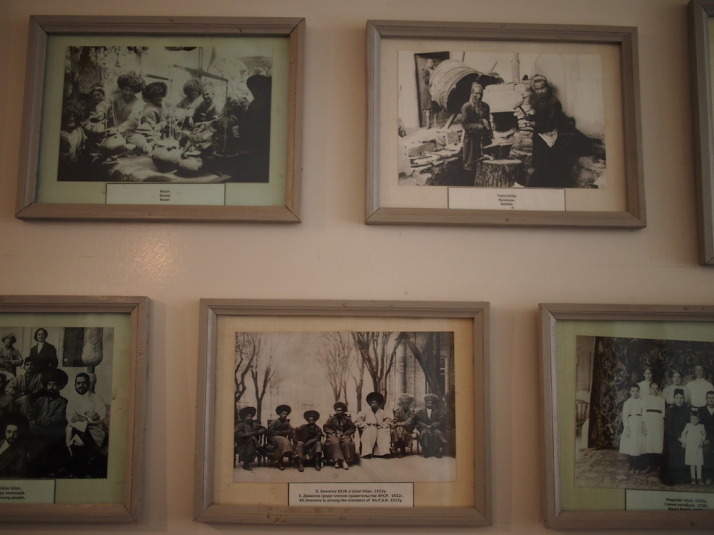 Next up we popped our heads into the Photography Museum which had a very impressive collection of old black and white photos of Khiva from the 1920s and 30s, including some exposed onto glass! After we recharged our sightseeing batteries with tasty home-made somsas (triangular pasties about the size of your hand, similar to an Indian samosa but oven baked rather than fried) and copious amounts of tea in a little cafe in the bazaar just outside the East Gate, we tackled the lavishly decorated, massive Tosh Hovli palace – so big it’s in 2 parts! 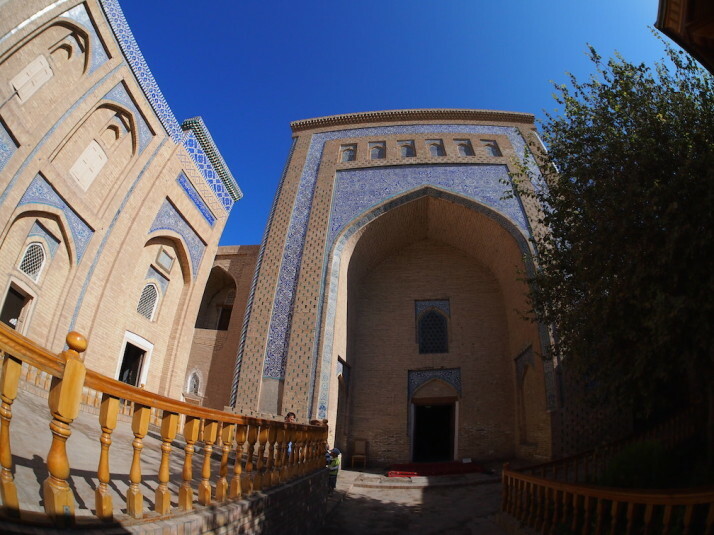 In contrast to the Tosh Hovli Palace where seemingly every internal surface is decorated, our next stop was the Juma Mosque – my favourite of the day..
Just outside the walls to the north-west is the Isfandiyar Palace. We double-checked the map when we got there as it looked pretty non-descript from the outside and we were the only people there – besides a local guy sitting on the step. 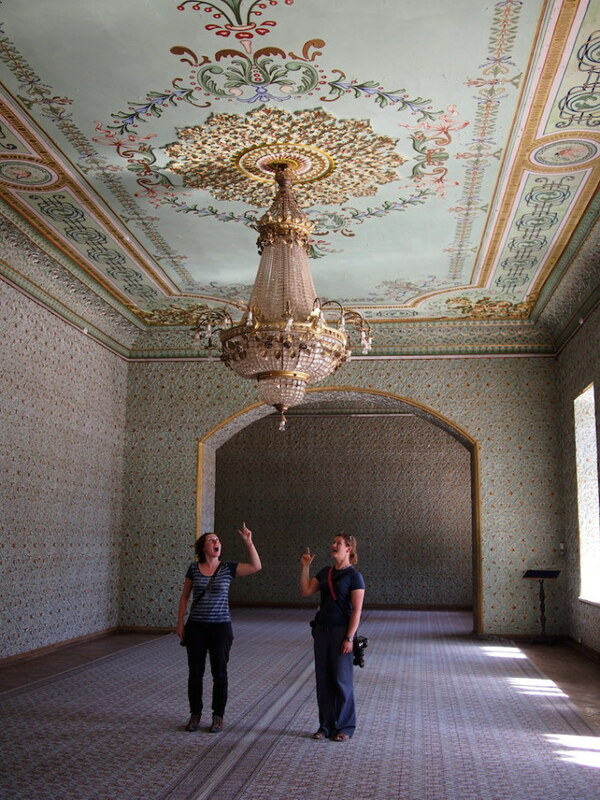 But inside awaits the biggest assault to the senses all day..
CAPTION COMPETITION: Julie and Jo exclaiming over the chandelier in the completely over-the-top Isfandiyar Palace. It’s bold and bonkers and we loved it! 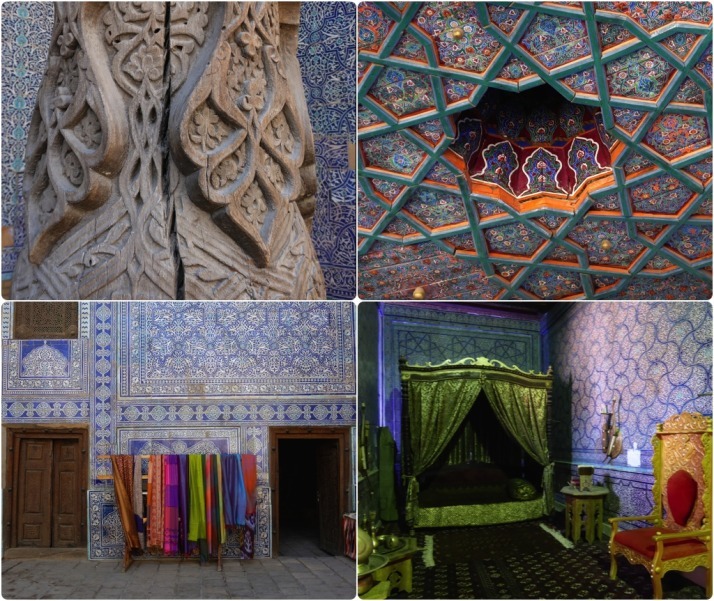 Every room overloaded our senses with colour and patterns. Somehow, it made complete sense that the only suitable furniture that wouldn’t cause further clashes would be mirrors..
We’d saved the Kuhna Ark for last because we’d read it was a good vantage point over Khiva at sunset. 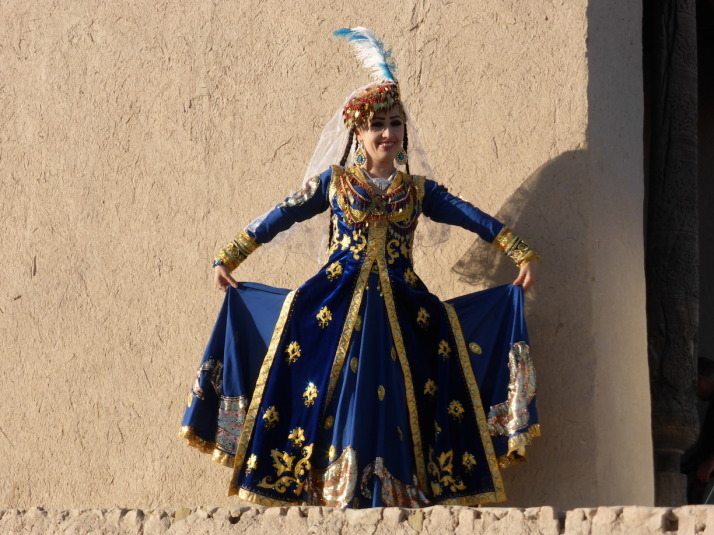 As we climbed up to the watchtower (which was 2,000 som extra, about 40p) we heard Uzbek pop-music, and found ourselves in the middle of a music video shoot! Not only was she a great dancer, she was happy to pose for the multitude of tourists in between shots. We don’t know her name, but she was described as “the best” by the crew and, amazingly, we saw her again on the Uzbek MTV when we had dinner later that night!! I got talking to a smartly dressed guy who was hanging around while the filming was going on, and through an interpreter I found out he was the singer who wrote the song she was dancing to! I haven’t been able to find his track (as I suspect it isn’t yet released), and there’s another famous Uzbek singer called Athambek. From his handwriting, I think his song is called “Noziga Boylaribgoldim” – if you find it please drop it into the comments below. 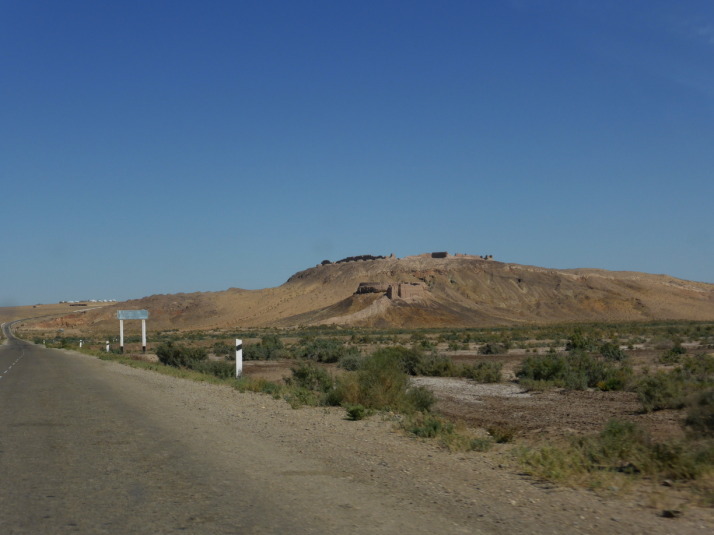 Here’s a photo of Athambek..
As we’d seen pretty much everything on our list the day before, we arranged a 6-hour, half-day taxi tour of Ancient Khorezm. Here’s the introduction from the Lonely Planet.. The Amu-Darya delta, stretching from southeast of Urgench to the Aral Sea, has been inhabited for millennia and was an important oasis long before Urgench or even Khiva were important. The historical name of the delta area, which includes parts of modern-day northern Turkmenistan, was Khorezm. 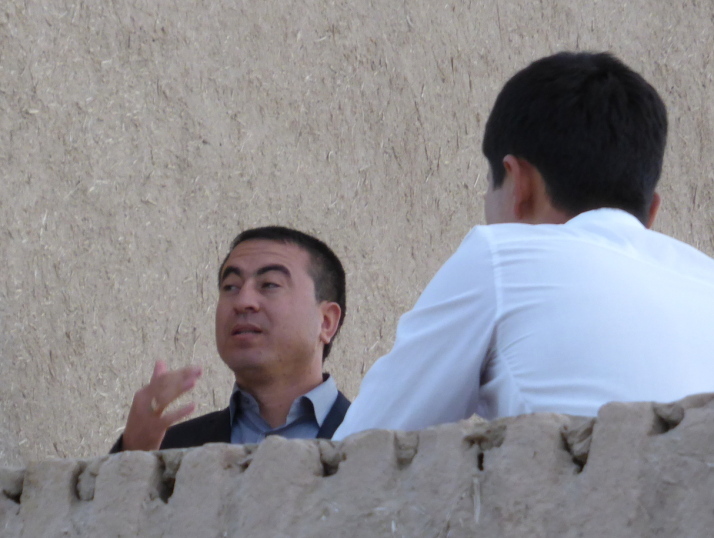 The tour took us to three of the main qalas, starting with the square Kyzyl Qala. We caught a quick glimpse of it just before we turned off the main road and onto a bumpy dirt track, and as we rounded a small hill of dirt, the massive towering mud fortress stood in front of us.. The square Kyzyl Qala still standing after more than 2,000 years. An excellent example as we walked pretty much all the way around it before we found a way in! 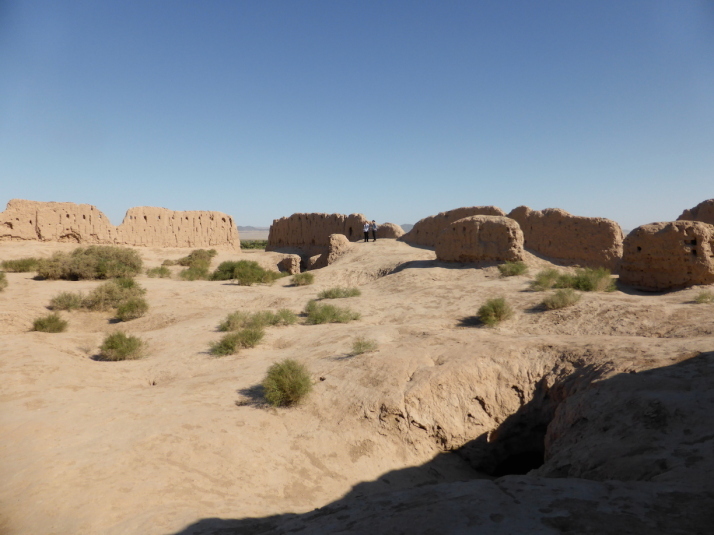 Next up was the main temple complex of the Khorezm kings who ruled the area in the 3rd and 4th centuries, the massive Toprak Qala. We found a lot of the rooms were still visible, as were the doorways linking them. Nearby were the modern foundations of a recent excavation team. 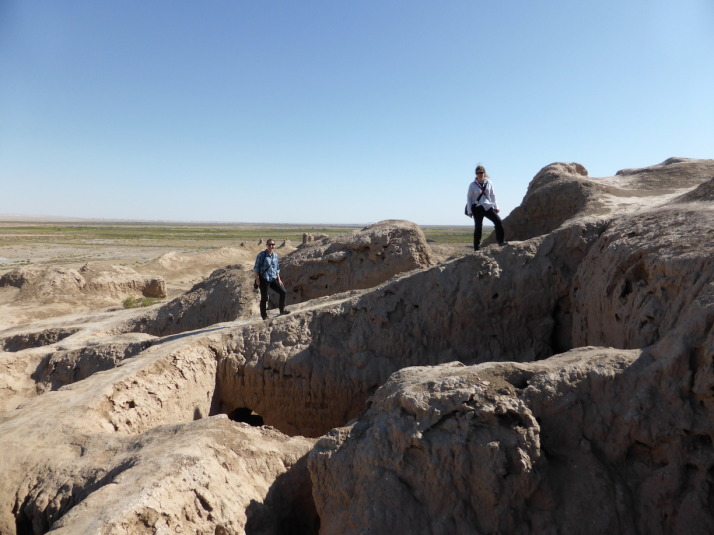 The final stop on our qala gala were the 3 ruins of the very impressive Ayaz-Qala. 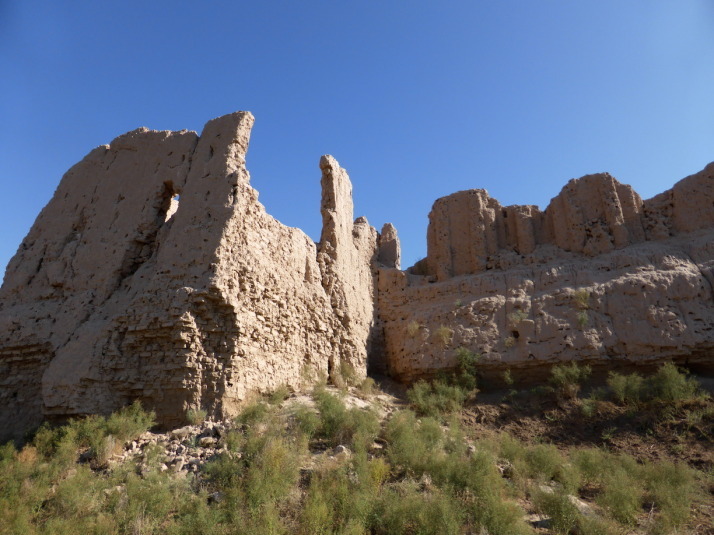 Our driver gave us the choice to drive up the hill, walk down and pay an unofficial entry fee levied by the ger camp nearby, or park at the bottom and scale the walls, thereby avoiding the fee – we opted to storm the walls! 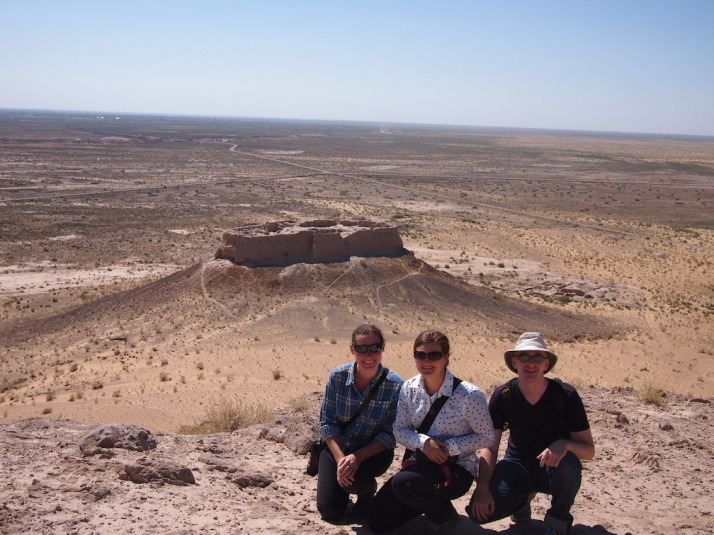 Julie, Jo and I having scaled the walls of the Ayaz-Qala fortress. This one was our favourite as some of its tunnels were intact and we could crawl through them! 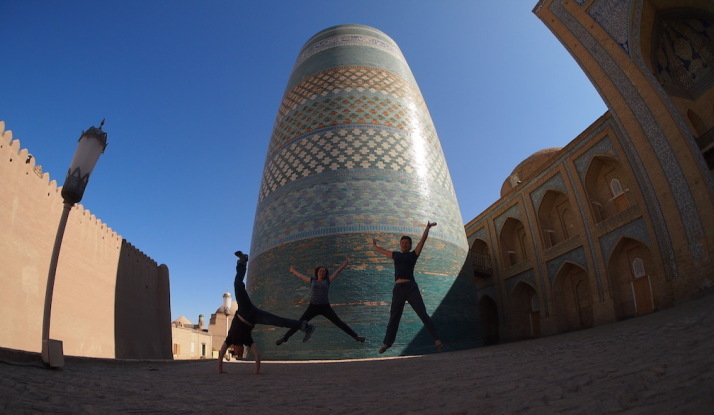 Thank you Khiva, the compact Silk Road city with the adorable stumpy minaret..
P.S. Don’t forget the caption competition! 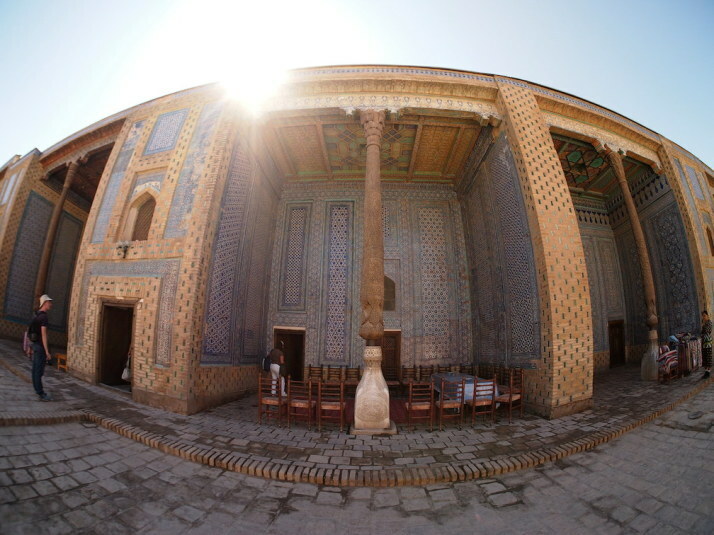 This entry was posted in Places and tagged Castle, Khiva, mosque, Museum, Uzbekistan on October 6, 2014 by Andrew. What is 11 + 30 ?